Lip balm provides an occlusive layer on the lip surface to seal moisture in lips and protect them from external exposure. Dry air, cold temperatures, and wind all have a drying effect on skin by drawing moisture away from the body. Lips are particularly vulnerable because the skin is so thin, and thus they are often the first to present signs of dryness. 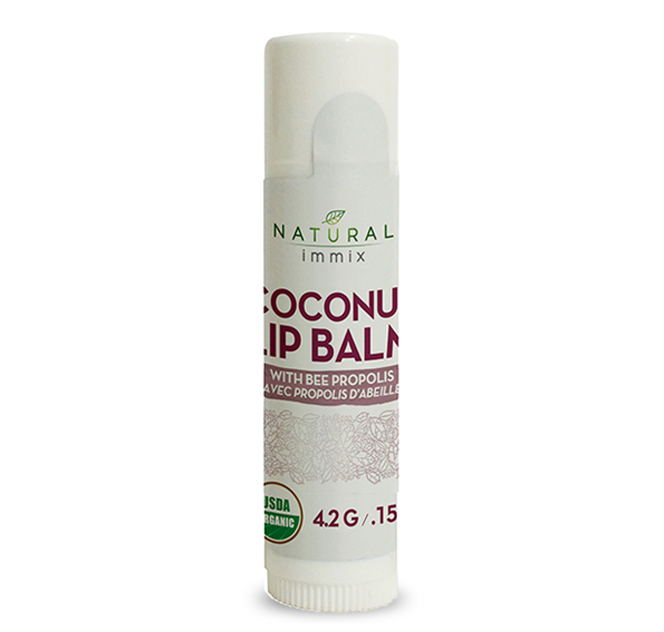 Natural immix USDA Certified Organic Lip Balm provides lips with moisturizing nutrients and comes in 2 great flavors: Mint Burst and Coconut. It contains Organic Aloe Vera, Cocoa Butter, Shea Butter, Bees Wax, Sunflower Oil, Vitamin E, and Soy Bean Oil. It also contains Certified Organic Brazilian Bee Propolis which is traditionally used in Herbal Medicine to assist in minor wound healing.